The future of putting now. 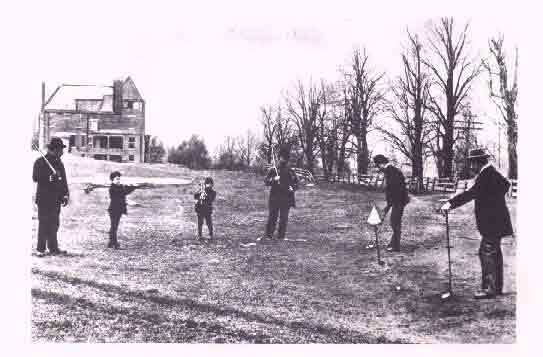 Early US greens were grass, except where aridity or difficulty of irrigation dictated otherwise. Sand greens were found mainly in the South, Southwest, and arid Western states. Also, Australia, Canada, and Puerto Rico. 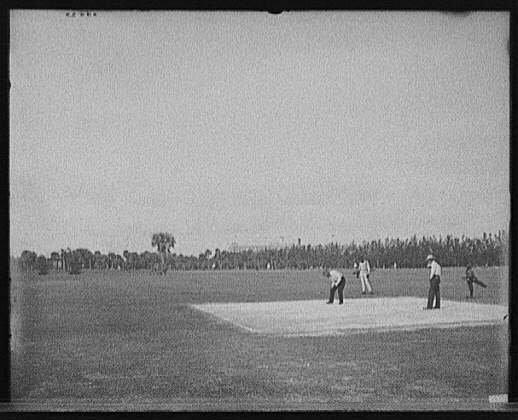 With the development of new strains of heat-resistant and aridity-tolerant grasses circa 1930, the sand greens started being converted to grass. But some conversions didn't occur until fairly recently, and the world still has quite a number of sand greens today. 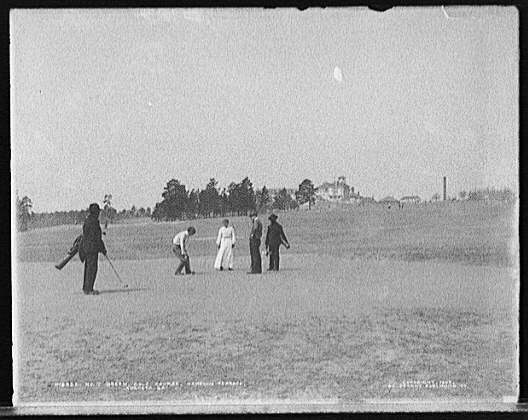 "The "greens" of Pinehurst golf course were actually made of sand until the mid 1930s when grass was finally grown successfully on the area's hardpan surface. Horton Smith here watches Bobby Jones putt out at the 5th hole on No. 2 in March of 1935." Advice: "Not a long course, no sand traps or water hazards. Straight shots keep you out of trouble. Wet sand greens are fast in inclement months, likely play slower in hot, dry weather. 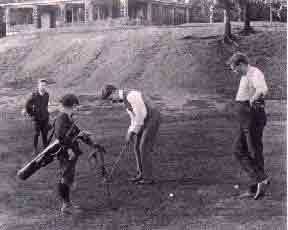 Task of sweeping the green after putting usually falls to the loser of the hole." Golf Timeline Creeping bentgrass developed in 1927 by USDA. Golf Digest: Design and history of Pinehurst No. 2 golf course Bermuda fairways 1907, sand greens until 1935. Echo Hills, Wichita KS Built with sand greens in 1930s, converted to grass 1979-1980. 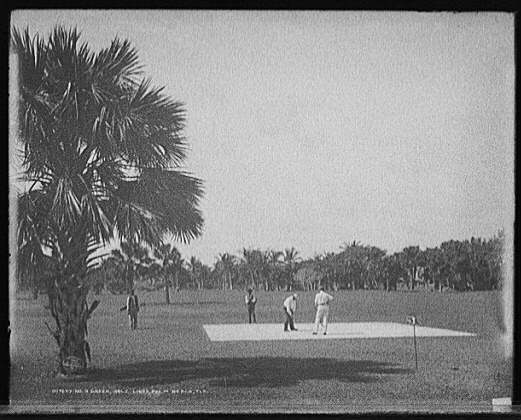 Puerto Rico Golf Association Sand greens common from 1930s into 1950s and 1960s, when new bermuda strains were developed. "The Viking was built with 9 holes and 9 holes exist today. 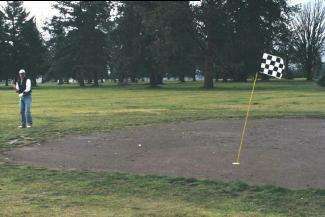 In 1965 Golfers teed off on hole number one where the green for hole 9 is now, and ended at the current practice green. These greens were about 30 feet across and were actually sand covered with oil. I have been told that many people saw these oily greens from the road and stopped by to find out what these strange black circles were! 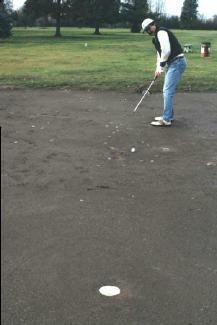 After each round of golfers finished putting, the sand of course had to be dragged. 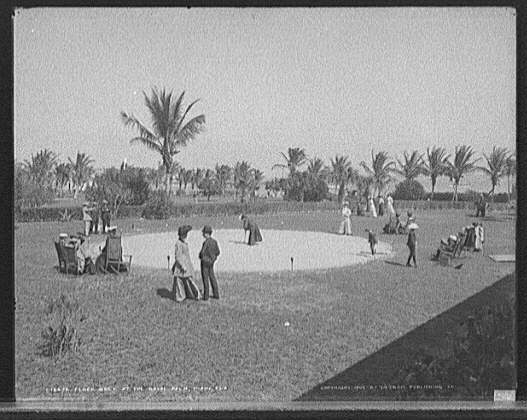 Large carpets were used to smooth out the sand which were a great burden to the golfers. The members knew that greens needed to be replaced with grass. The day that grass greens became a reality golfers went around the course twice, the first round on sand greens and the second on grass!!! That night the members enjoyed a large bonfire of burning carpets. Irrigation was now the problem at hand. The greens needed water and again the members of the community came to the rescue. Each took his turn until the irrigation system was afforded. Even then only the greens were watered the fairways came later."